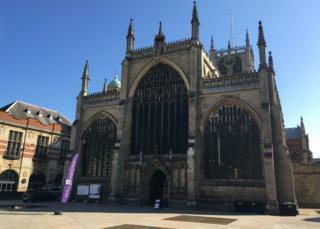 Image caption Hull Minster wants to be "a hub for visitors and tourists"
Hull Minster has been given a £3.9m grant to create a visitor centre, cafe and exhibition spaces. Highways England, which is providing the funding, said the money would help "safeguard the Minster's heritage for future generations". The grant is part of the A63 Castle Street improvement scheme, which passes 100m (328ft) from the church. The church has already spent £3.5m on restoring and remodelling its interior and creating a new outdoor space. Under the plans, the money would go towards building a glass, bronze and stone extension on the south-west face of the church, which will house "a visitor and heritage centre with exhibition spaces, a café and other facilities". An education and learning centre, disabled access and a community fruit and vegetable garden has also been proposed. Work on the new scheme is expected to start in the spring. Vicar of Hull Minster the Reverend Canon Dr Neal Barnes said: "This is wonderful news for the Minster and the city of Hull. "It will enable us to fulfil the Minster's potential to be a hub for visitors and tourists to the historic Old Town." James Leeming, senior project manager at Highways England, said: "It is a real pleasure to support an iconic venue like Hull Minster as part of our important work in the city." In 2015, the church started a campaign to raise £4.5m for its regeneration project but only secured £3.5m. The A63 Castle Street scheme is a £250m project to develop a key route in Hull by building an underpass at Mytongate and a footbridge linking the marina and city centre. Work on the initiative has been delayed four times with the latest start date expected to be March 2020 and completed five years later. During World War One, the church was saved from bombing on 7 June 1915 due to a change in wind direction.